NRA Basics of Personal Protection Outside The Home Course is a comprehensive and intensive approach to equip the defensive shooting candidate with the skills needed to survive serious adversity. The NRA Personal Protection Outside the Home is divided into two phases (level one and level two). This level one course is nine hours and offers the essential knowledge and skills that must be mastered in order to carry, store, and use a firearm safely and effectively for personal protection outside the home. After the classroom portion, students should expect to spend several hours on the range and shoot a minimum of 100 rounds of ammunition. Students will receive the NRA Guide to the Basics of Personal Protection Outside The Home handbook, NRA Gun Safety Rules brochure and the appropriate course completion certificates. Prospective participants must show proof of an NRA Basic Personal Protection In The Home Course Certificate. The NRA Personal Protection Outside the Home – Level Two Course focuses on: Developing concealed carry shooting skills for use outside the home; Special defensive shooting techniques; and Concealed carry, self-defense and the law. This is an additional five hours of range training and teaches advanced shooting skills. A minimum of 115 rounds of ammunition will be needed. 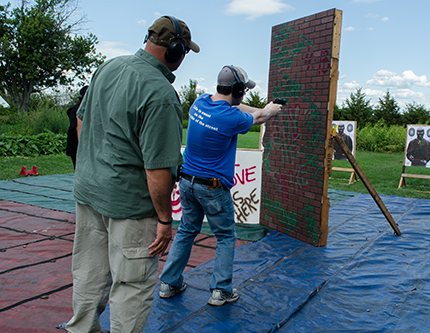 Prospective participants must show proof of an NRA Basic Personal Protection Outside The Home Course Certificate.